Assume you are working in a market research firm. You are going to give an important presentation. The question you need to answer is: "Why do people work?" Is it the money? Career? or, is it just for fun? How do you present this to your client so that it answers the research question in a crystal clear manner? The simplest way to present this data is by putting it in a 'Table'. Exactly like the image above. 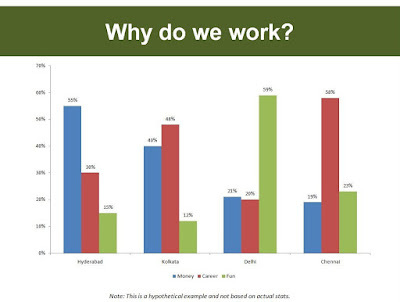 After putting up the slide you can talk about things like; "People in Delhi work for Fun while Chennai for Career. However the people in Kolkata are split between Career and Money, etc etc..."
Most of us do this and move on. How do you know this is the best way to present this data? Can you think of other ways to present. Remember, you should present an information and not just raw data. The table is mere raw data. Great! This way the information is presented better and it is very easy for the audience to 'see' what you have to explain if you just put the entire table there. 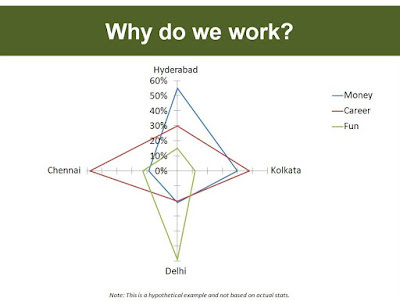 When you put this slide, the audience can easily see that people in Delhi clearly work for Fun while people in Chennai choose Career. It becomes complex to juggle between the legend and the chart. Red is career and it is more in Chennai. But how much percentage? I have not plotted data values above. If I do then the clutter would be huge. 1. Try out two or three ways to present a data. Do not just settle with whatever is easy or whatever comes to mind first. 2. Always choose a simpler graph (eg. bar graph) over a complex one (eg. radar). I strongly recommend not to go for fancy charts and complicate your message. Your objective is to simplify and not to confuse. If a chart needs too much of explanation, it is not a good chart. In our example, using a Bar Graph makes more sense. Can you still use a Radar in this case and present the data in a better fashion?